Ponds, Ponds, and More Ponds: Which Type is Best for Your MN Landscape? For the moment, the only moisture on the ground may be the mud and muck left over from winter, but warmer climates are just around the corner, making right now the perfect time to think about beautifying your property with a pond. Formal ponds tend to be built in geometric shapes and are most commonly seen near traditional estates. Informal ponds are more commonly seen in private gardens. The are often free-form structures such the one shown in the photo at right. Regardless of who designs them they, are typically simple to construct. The lovely koi ponds, which are populated by colorful fish, are highly popular. The presence of the fish, however, makes this type of pond fairly high-maintenance. Not only must the fish be fed but the temperature must be properly regulated. And here in Minnesota, you’ll need to have a plan for housing your fish when the outside temperature gets too cold. Container ponds are little vessels, such as buckets that contain water and some plants. This type of pond is ideal for a small garden or patio. They can be easily done without professional help. Water gardens are primarily defined by the fact that they contain goldfish and aquatic plants as well. The presence of such plants as lilies and arrowheads can create a stunning landscape and can also attract wildlife. A swimming pod (also known as natural pool) is simply a large pool of water that has a swimming pool-like container overflowing with water and planted with greenery around the perimeter. This style of pond is particularly decorative. Planting plenty of greenery is a good way to give it a natural effect. These ponds are meant to look as if Mother Nature herself did the design and installation. 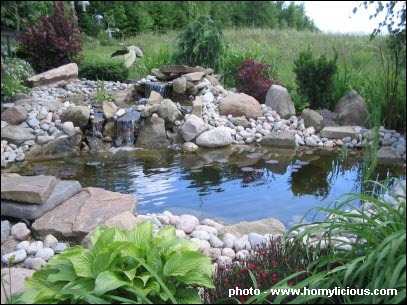 With our help, Minnesota pond design and installation can be made in easy, painless steps! Give us a call today to arrange a consultation – it’s the first step in creating the perfect waterscape design for your yard! Architectural Landscape Design is a licensed pool and spa design and installation contractor serving the Minneapolis area as well as outlying communities around the Twin Cities.